Codemasters has explained its decision to drop legendary rally driver Colin McRae's name for the title and box of upcoming racer DiRT 3. McRae, who along with his sons and two family friends died in a tragic September 2007 helicopter accident, has long been the face of Codemasters' much-loved rally series. The 2009 game was called Colin McRae: Dirt 2 in all territories except the US. Now, with DiRT 3, McRae's name is nowhere to be seen. 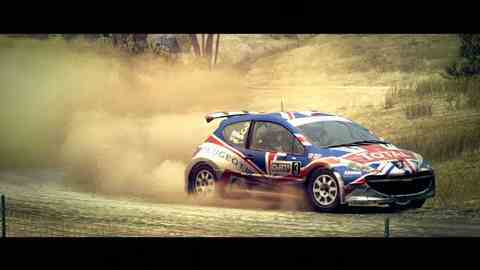 "DiRT 2 was very much our tribute to Colin," communications manager Andy Gray told Eurogamer. "It had a tribute section right at the end as well. "It's been a few years now since Colin passed away, so the time had come to remove his name from the box, but still keep his influence in the game, not just in terms of the content but in the ethos." While McRae's name is no longer a part of DiRT's title and box art, his influence is still keenly felt in the game's design, chief games designer Paul Coleman explained. "Colin's cars are still in the game. We still work closely with his estate. We've made sure we were in dialogue with his wife and agent, who still represents him, at all stages of development. "His charity is represented in the game. We've given one of our racing teams you can compete in during the career a full livery dedicated to his charity. "And Colin's ethos of, if in doubt, flat out, that drives the way we design the game. We want players to not think of consequences, to just go as fast as they can. Our flashback tool allows players to do that. If they make a simple mistake they can quickly rectify that. "We want players to be all about the racing and not worrying too much about the management and repair aspect of the game. That's something we're looking into for future titles, but right now it's all about just getting into the best car for the stage and then racing it as hard as you can, which is what Colin was about." Coleman went in-depth on the evolution of the series in a recent DiRT 3 interview with Eurogamer. Offer expires Saturday at 6pm.